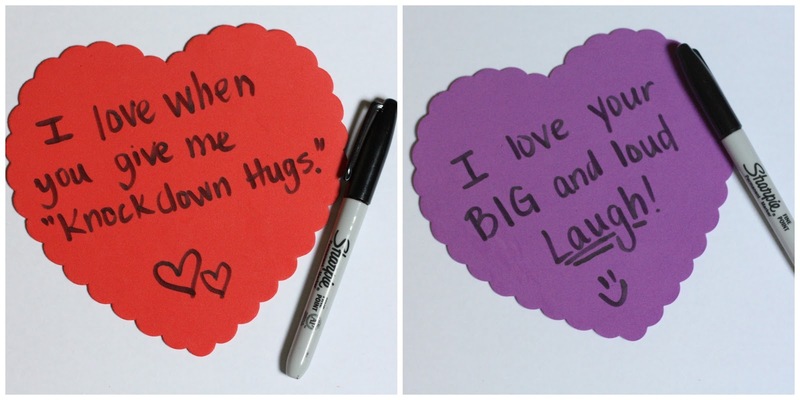 Valentine's Day is right around the corner and although we haven't even reached Feb. 1st yet, I wanted to go ahead and share this idea in case anyone else wants to use it this Valentine's season. I love pretty much any holiday and any reason to celebrate. I vividly remember being in 2nd grade and exchanging valentine's with my friends during our class party. I came home and told my mom it was the VERY BEST DAY I had ever had in school so far. I loved it that much. 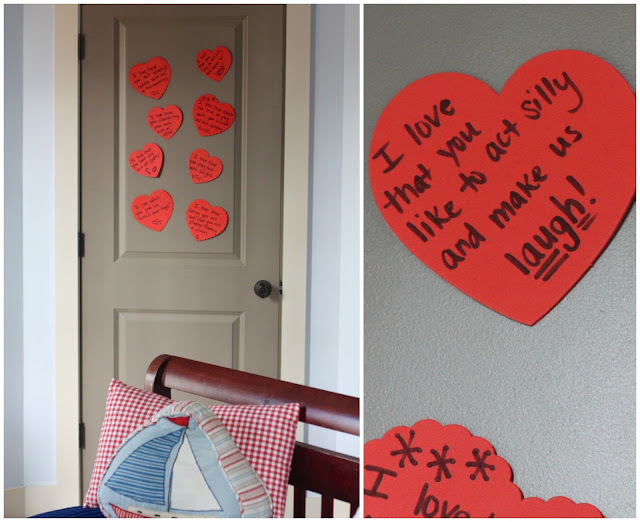 Fast forward to college and my girlfriends and I went all out for our then boyfriends (who all became our husbands) on Valentine's Day. We crafted all kinds of handmade gifts and even made crossword puzzles with clues about our relationships for them to complete. Yep, that is a bunch of soon to be teachers for you. When Valentine's Day came and went we were all a little disappointed because we got no creative, hand-made crossword puzzles back. Ha! And you know what we all discussed and realized after that? We were all doing for them what we had hoped they would do for us. Most guys just don't think that way and while my Mr. can pull of some romantic gestures now and then (I am the proud owner of a stick he whittled for me in high school that says I <3 U) it isn't always the norm. 13 years of marriage in and I've given up on the romance part of Valentine's Day and instead now I love to focus all that love towards my kids! There is no better time to tell them over and over not just how much you love them, but why! 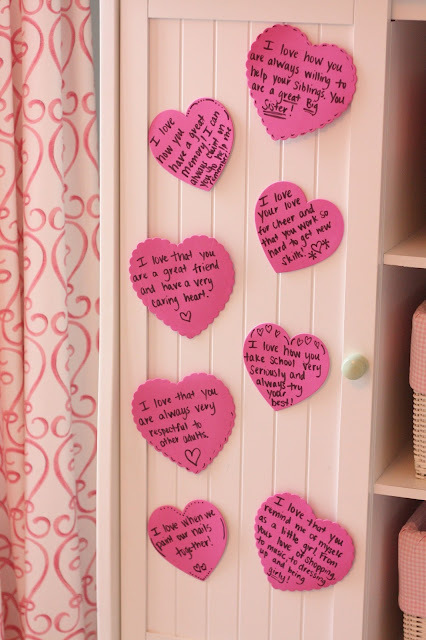 I got this idea from my friend, K. One time we were visiting them in February and I saw hearts all over her daughter's doors with little I love yous and reasons why she loved them. It was absolutely the sweetest thing and I was so excited to do it with my own kids. Only problem is that I always forget each year so this year I'm getting a head start and prepping this little activity before February 1st arrives. 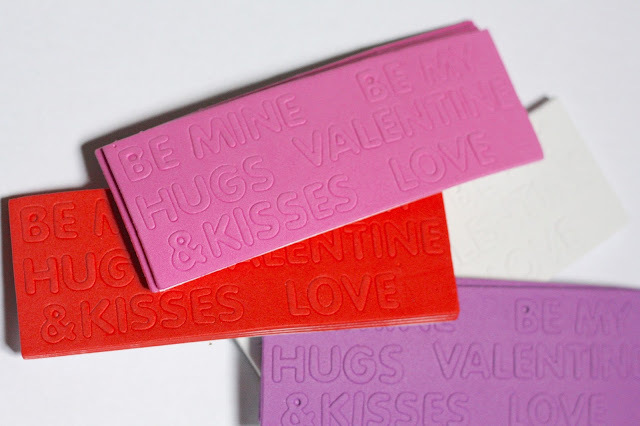 I ordered this pack of DIY Fabulous Valentines from Oriental Trading to use. 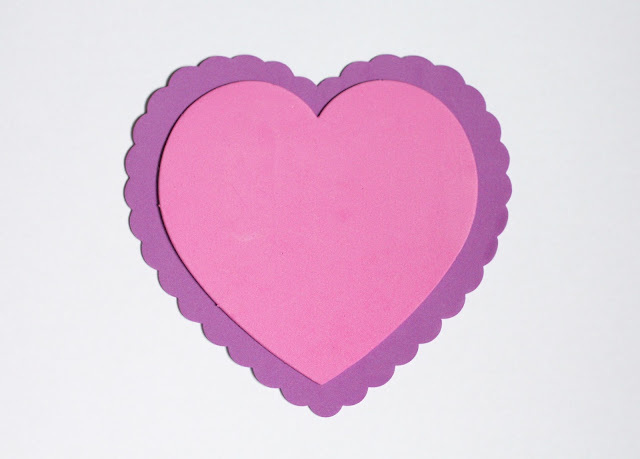 It comes with peel and stick cutouts and letters to create your own Valentines. I'm just saving those and adding them to the craft supplies in our playroom because I know my kids will put them to good use. Then with the larger hearts I wrote out lots of different reasons why I love each of my kids. 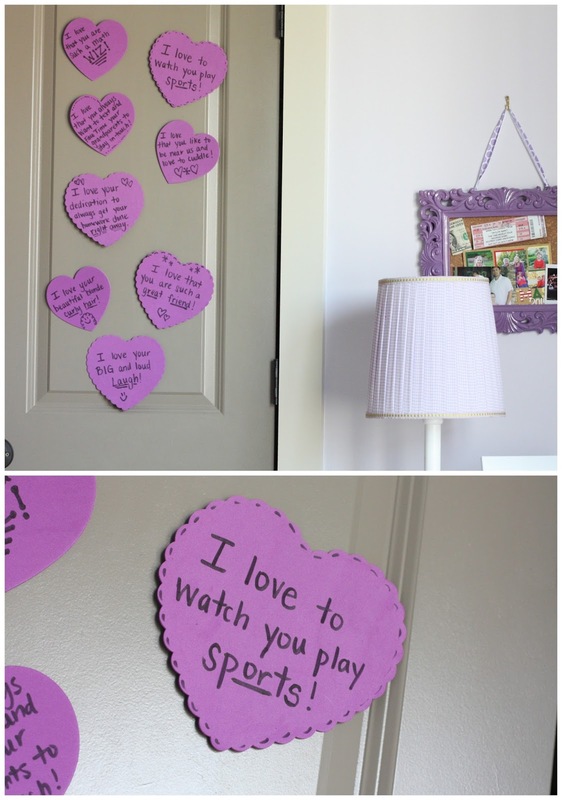 Each night after they go to bed I'll stick one new heart on their door or somewhere in their room so they wake up with a new message from me each morning leading up to Valentine's Day. I tried to come up with a list of things for each child that was really specific and unique for each of them. 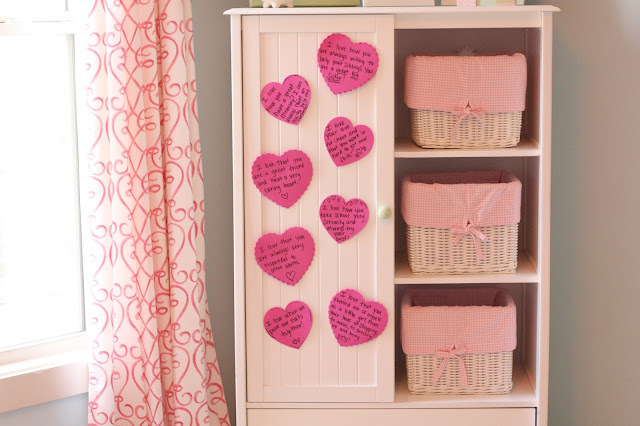 I'll use blue painter's tape to hold the hearts up so I don't have to worry about paint being peeled from the doors or furniture. I put these up while they were at school today so I could show y'all, but I'll will keep them hidden and start next week! We all love our kids. I just don't know that in between the rushing and the nagging to get homework done if I tell them enough. I'm really hoping that this little activity will help build up their self-esteem. I know it will make me so happy to see them beam with happiness as I share with them just some the reasons I love them and think they are so awesome! I was given this product by Oriental Trading in exchange for my review. All thoughts and opinions are my own.